When you live in a small space, countertops and surface areas are premium real estate. Do you put a piece of art on the top of your bookshelf, or one of those plants you purchased from Amazon? Should you put flowers in the middle of your coffee table, or a collection of coffee table books? Do you really need a wireless charger on your nightstand, or will your cluttered cords do just fine for now? If you're busy KonMari-ing your closet and your life, chances are you're looking for a place for everything, and to put everything in its place. That includes how you put your phone to bed at night. 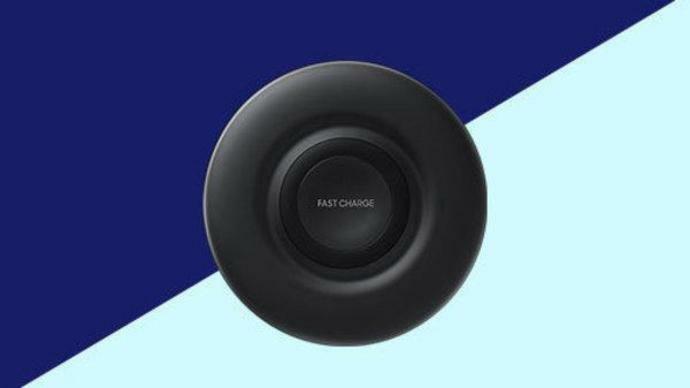 Luckily, this fancy Samsung wireless charging pad is on sale at Verizon (which owns Verizon Media, HuffPost's parent company) through March 31 for only $40. That's $20 cheaper than its full price of $60. Plus, with the code HUFFPOST5, you can get an extra $5 off, so it's only $35. Don't worry if you have an iPhone - this charger will work for it, too. The "Type-A" folks among us know there's nothing worse than a cluttered countertop or nightstand, especially with too many charging cables. Whether you have a little one running around or a curious pet who will chew anything in sight, wireless charging pads are a clever way to keep unwanted hands and paws away from cables and cords. Not to mention, wireless charging is actually better for your phone than traditional charging cords because wireless chargers shop charging your battery when it hits 100 percent. These days, more and more phones are capable of wireless charging, and most wireless chargers come with "fast charge," which is a fancy way of saying they'll charge your device as a speedier rate. Spend less time plugged in and more time untethered while this deal lasts. But get moving ― it's only on sale through the end of March. GET THE SAMSUNG WIRELESS CHARGING PAD FOR $35 WITH CODE HUFFPOST5. The telecommunications company now expects adjusted earnings per share to grow slightly this year.